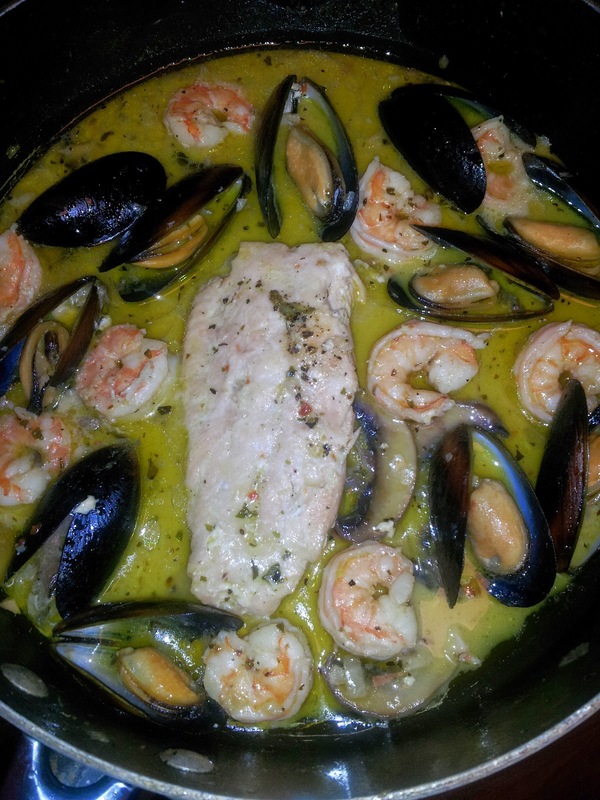 Seafood Scampi - this is my made up yummyness ! Ok Lets get to the fun part ! Salmon cooks fast but not as fast as shellfish ! Start with the salmon and lay it on top of the juices, put a bit more of the seasonings and cover with lid. Salmon is cooked when its pink and flaky .. and easily overcooked ! Give it maybe 7-8 min and when it looks like its half cooked thru and half raw flip it over and do the same..
At this time you can check t make sure that the other seafood is cleaned divined and ready to go . When the salmon is almost complete (3mins or so into the flip side) you can toss in your shrimp. I like to use wild caught peeled and divined. Shrimp will go from that grayish to a cooked shrimp pink color all around when done. Important to cook all the way thru. Toss in a bit more of your herbs at this time as well as most of the juices left form orange and lemon. When the shrimp looks half done (one side is pink the other side is still raw cooking) toss in the muscles - muscles steam fast so at this time put the lid on and enjoy a moment of yummy smelling goodness ! Once it all looks good and done let the lid sit on and simmer it for a few moments.. its DONE ! Taste it and make sure you don't need anything extra.. I love lemon so I usually end up adding a bit more to taste ! I love to serve this with white or brown rice and add the juices on top of it. A huge hit for my 6yo daughter too and it's healthy for them ! A side of fresh veggies or maybe nothing at all cause it is amazing by itself !